Created with Material Design at its core, Talon for Twitter includes stunning layouts, eye catching animations, and that buttery smoothness you should expect from the latest and greatest apps. 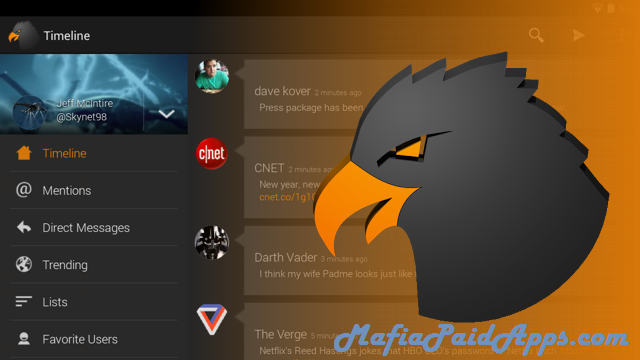 Talongives you everything you could ever need to experience Twitter. • Materialized theme engine for fine-grained color control. • Completely custom swipe-able pages for the main screen. Want a list or saved search for easy access? No problem! Don't use direct messages? Go ahead and take them out. Choose what you want to see and where you want to see it. • Night Mode and Do Not Disturb Mode. • Compact Timeline Layout option if you aren't as into the design and just want to mash as much onto the screen as possible. • Have favorite users? See only their tweets or have options to get notified whenever they post a new tweet! • Don't want to leave the timeline? "Peek" into profiles, images, GIFs, and videos! Similar to Apple's 3D Touch. • Powerful mute options for users, retweets, hashtags, Twitter clients, and expressions. • Support for 2 accounts. • Google Chrome Custom Tabs can be used for the in-app browser. • Expandable, actionable, and dynamic notification system on all versions of Android. • Easily see who has quoted, liked, or retweeted any tweet! • Use TweetMarker to keep your timeline position between multiple devices! • Play Twitter videos and GIFs without leaving your timeline! • Find the perfect GIF, for your moment, using Giphy when writing a tweet. • Attach up to four pictures to your tweets. • Crop, rotate, and zoom to get the perfect photo before you post it! • Native YouTube, Vine, Twitter GIF, and Twitter video playback. • Everything (likes, retweets, quotes, conversations, and more) can be done directly on the timeline, with an in-line tweet expansion, so no jumping between screens to get the info or do the interactions you want! • Android Wear app to view, like, retweet, and reply to new tweets on your timeline, without having to take out your phone. • Quick actions on the timeline for fast likes, retweets, replies, and more. • Clickable and long clickable links, hashtags, and @ mentions. • Widgets to view the home timeline, mentions, and unread counts. I take a lot of pride in what I have created, enjoy Talon and feel free to contact me with questions or requests you may have. The best way would be either through email or get involved on the Google+page (link below). v5.2.3 includes various bug fixes, UI improvements, and translation updates. For a detailed list of changes, head to the "What's New" section of settings!